Optimizing and Testing WLANs explores proven techniques for maximizing the coverage area and performance of wireless networks. The author's insider position on the IEEE committee developing standards for WLAN testing ensures timeliness and technical integrity of the material. The book includes coverage of newer multiple input/multiple output (MIMO) wireless networks. The techniques provided will allow engineers to help maintain continuous wireless connectivity to laptops and other mobile devices. 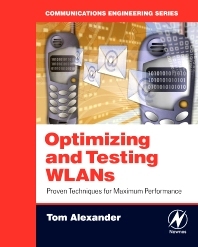 Optimizing and Testing WLANs is the first book to address the need to test WLANs (Wireless Local Area Networks) for proper performance and to optimize their operation as they become increasingly common. It covers test equipment and methods for the RF (wireless) and physical layers of WLAN, protocols, the application layer, and manufacturing testing. The emphasis throughout is on underlying engineering principles along with modern metrics and methodologies, ensuring this book gives both a solid theoretical background along with field-proven techniques and applications. A particularly engaging chapter deals with manufacturing test that describes some of the different manufacturing test setups and equipment. A concise introduction to deployment testing of "hotspots" and WLANs in enterprises is also provided. This text will be of interest to RF wireless engineers and designers, networking engineers, IT professionals and managers, and graduate students.